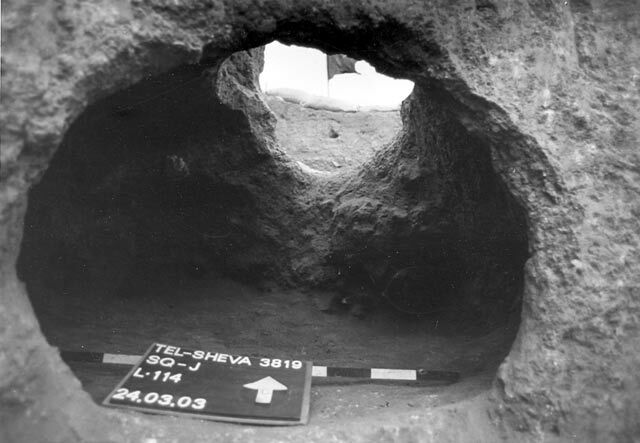 During February–March 2003, a salvage excavation was conducted in Neighborhood 36 in Tel Sheva (Permit No. A-3819; map ref. NIG 1840–60/5720–30; OIG 1340–60/0720–30), prior to development. The excavation, carried out on behalf of the Antiquities Authority and funded by the Israel Land Administration, was directed by Y. Abadi, with the assistance of H. Lavi (administration), V. Essman and V. Pirsky (surveying), T. Sagiv and M. Salzberger (field photography) and N. Zak (drafting). The excavation was conducted in eleven lots of the neighborhood, in whose other lots a previous excavation had taken place (Permit No. A-2062). Eleven squares were opened in the areas slated for construction, based on probe trenches and finds recovered from surface (Fig. 1). A few artifacts from the Byzantine period were discovered, although most of the finds dated to the Chalcolithic period. Mostly medium and large pits from the Chalcolithic period, which were dug into hard, natural loess soil and filled to their top with artifacts, were discovered. Pits of various sizes (diam. 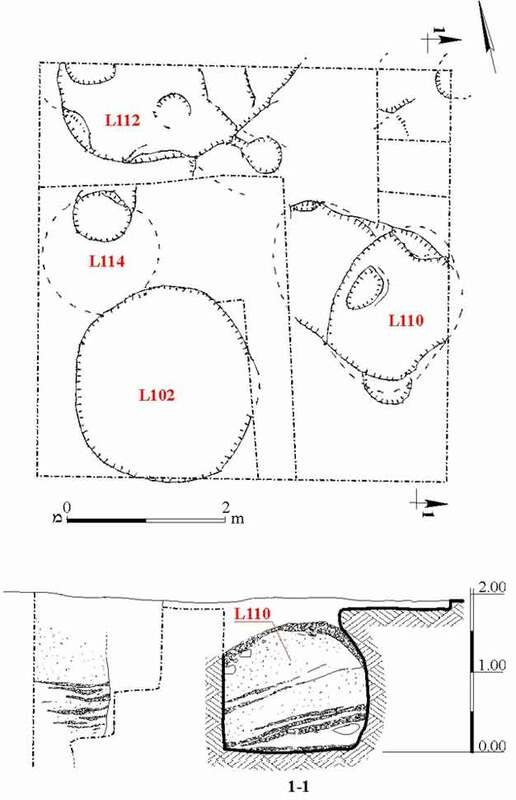 0.5–5.0 m) were excavated in Squares A, B, C, D, G, I and K. Due to the disjointed nature of the excavation not all of the pits were entirely excavated and sometimes they extended beyond the boundaries of the excavation. Small pits were also found, sometimes cut into the bottoms of large pits. Sundried mud bricks were exposed inside the pits and along their edges; these sometimes served as part of the fill in the pits and sometimes as walls. 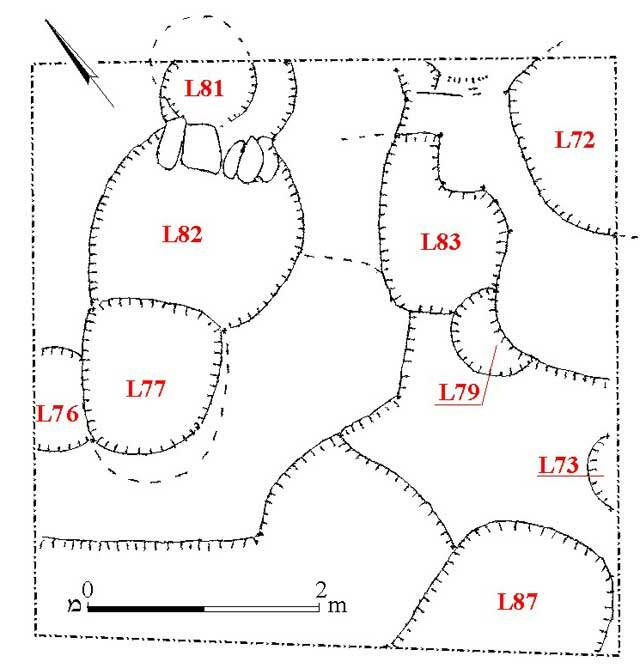 Generally, the pits in the squares were not connected; however, in Squares H and J several pits of different sizes that were joined to each other with openings and channels were excavated. They were filled to their top with soil and ash mixed with artifacts that dated to the Chalcolithic period. A complex of eight pits that were connected by way of arched passages and tunnels (average diam. of pit’s bottom 1.4 m; Fig. 2) was excavated in Square H. The elevations of the openings of the pits and those of their loess floors were not uniform. Two pits in Square J were connected by way of a tunnel and another complex consisted of two other pits and a shaft (Figs. 3, 4). Only one pit in Square J (L110) had alternating layers of ash and soil. The ceramic artifacts were characteristic of the Chalcolithic period and included V-shaped bowls, holemouth and other jars, churns and cornets. The flint-tool assemblage, which included sickle blades and adzes, was also typical of the Chalcolithic period. In addition, flint debitage was collected, as well as bone and stone implements, animal bones, mud bricks, stone pendants, shells and carbon. Artifacts from the Byzantine period were discovered in Squares A, E, F and H. A section of a fieldstone-built wall, preserved two courses high, nine tombs built of stone slabs that were not opened and small pits that contained fragments of pottery vessels from this period were exposed. The Chalcolithic settlement of Tel Sheva is part of the array of settlements along Nahal Be’er Sheva‘, which is referred to as the ‘Be’er Sheva‘ cluster’ of the Ghassulian culture. 1. Plan of the excavation areas. 3. 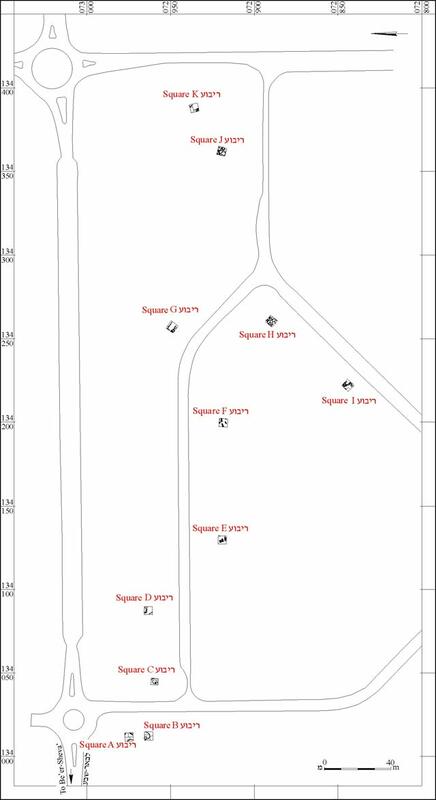 Square J, plan and section. 4. Square J, Pit 114, looking north.